The park protects a series of dry meadows at the top of a basalt cliff formation and the wetter meadows at its base, along with the interior Douglas fir forest. The dry, seasonally-wet, diverse meadows are extremely fragile. Five red/blue-listed vascular plants are known to occur including red-listed Obscure Cryptantha (Cryptantha ambigua) and Needleleaved Navarretia (Navarretia intertexta) and blue-listed Northern Linanthus (Linanthus septentrionalis), False-mermaid (Floerkea proserpinacoides) and Awned Cyperus squarrosus. Secondarily the park provides low-impact recreational opportunities and contains part of the regionally-significant 55 km long High Rim Trail. No motorized vehicles are permitted in the park. National Topographic Series Maps Sheet 082L/03 (Oyama) at a scale of 1:50,000 cover the area. 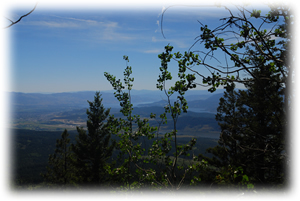 The approach trail is located just NE of Winfield at SW end of Long Mountain, S of Vernon, the park is accessed via the Beaver Main Forest Service Road – from Highway 97 follow Beaver Lake Road for about 12 km to the High Rim trail head. Hike north about 1 hour to the park. Conservation: The park protects representations of the Biogeoclimatic Zones Interior Cedar – Hemlock and Interior Douglas Fir. Contributions represent 2.12% of the total of these representations in the overall protected area system. June 2007 – Northern Sanicle, Pygmy bitterroot (Alpine lewiswia). May 2005 – Lupin, Wild strawberry, Heart-leaved arnica, Small-flowered Blue-eyed Mary, Upland larkspur, Early blue violet, Annual hawksbeard, Saskatoon, Low pussytoes, Alpine paint brush, Blue clematis, Few flowered shooting star, Old man’s whiskers, Round-leaved alumroot, Meadow death camus, Fairy slipper; False Solomon’s seal, Kinnikinnick, Fern-leaved desert- parsley, Crane’s bill, Shrubby penstemon, Yarrow, Common dandelion. September 2004 – Flowering thistle. Approved Purpose Statement and Zoning Plan [PDF] for Wrinkly Face Provincial Park is available online in pdf format. The basalt columns on the south west side of the cliff offer mountaineering opportunities for experienced climbers. There are several well-defined hiking trails in this park. For your own safety and preservation of the park, obey posted signs and keep to designated trails. Shortcutting trails destroys plant life and soil structure. The High Rim trail through the park is open to horses; please stay on designated trails. Wrinkly Face Provincial Park is open to the discharge of firearms during the lawful game hunting season. Please check the BC Hunting and Trapping Regulations for more information.